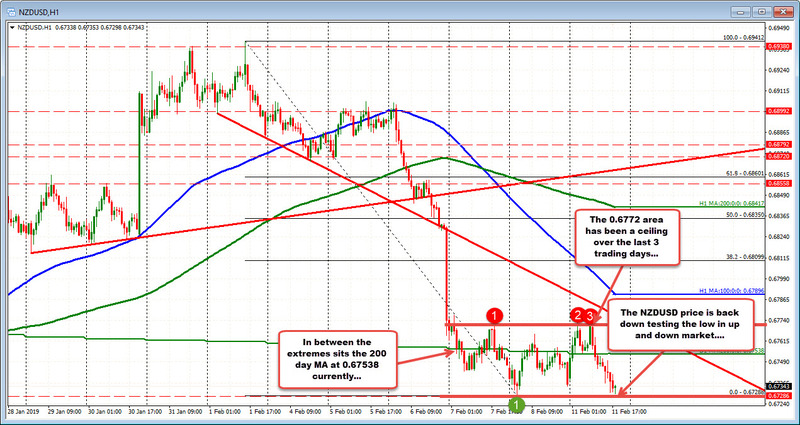 The NZDUSD is moving up and down and in the process is trading above and below its 200 day MA at 0.67538. Usually, the 200 day MA is a point of deflection or reflection. That is the price bounces off of it and races through it. When the price trades above and below it, the market has reached a level of equilibrium but is not sure which way to go. The 200 day MA is a long term "take a breathe and regroup level". The price action over the last three days has confined the range between 0.67288 and 0.6773. That is not a lot of range over a three day period. Eventually, there will be a break. The sellers are pushing the lower extreme now with a retest fo the low from Friday at 0.67288. The lows over the last 3 hours has ranged from 0.67298-318 - just above that low. Buyers are leaning, but I would expect stops on a break. ON the topside today, the highs stallyed near the Thursday high at 0.67712. The high prices today reached 0.67726 and 0.67714. Sellers can lean against the 200 day MA and hope for a move through the low. Alternatively, sellers can wait and sell against the ceiling with a stop above. Traders waiting for the push below or above, can wait for the break and jump on the break with hopes for more momentum.